Show your sister the special place she holds in your heart! Our Sister Bracelet is made of Sterling Silver Message Beads - Sister, Friends & Forever, Bali Silver Flower Beads and Austrian Crystals (colors of choice). Our bracelet includes a Sterling Heart Lobster claw safety Clasp and chain extender. 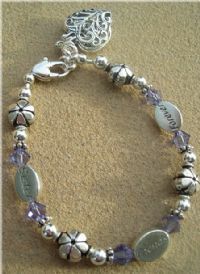 This bracelet is finished with a beautiful Sterling Filigree Heart Charm. 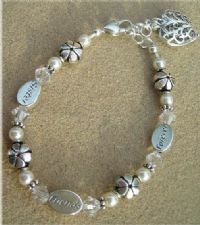 The “Sisters Bracelet” is adjustable and fits wrist size 6 3/4” to 8”.